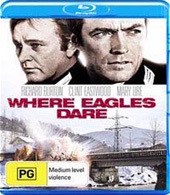 Where Eagles Dare, the highly-regarded 1968 war epic starring Clint Eastwood and Richard Burton, boasts a deceptively simple storyline. In the midst of World War II, a team of paratroopers must rescue a captured Allied general from a Nazi stronghold nestled high amongst the Austrian Alps. Needless to say the daring mission doesn’t entirely go according to plan; the plot grows increasingly (I would say wonderfully) convoluted and the main players are seldom exactly what they seem. Duplicitous officers, treacherous double agents, a murderous traitor in the midst of the rescue party and more stunningly shot action sequences than you can poke a bayonet at are all par for the course. The interrogation scenes are alternately thrilling and terrifying, and the film has been perfectly cast, with the beautiful Mary Ure superb as a member of M16 (or is she?) and Patrick Wymark his usual solidly convincing self. Shot entirely on location in Austria and Bavaria, Where Eagles Dare is, quite simply, one of the greatest spy films ever made. The movie finds both Eastwood and Burton in near-incomparable fettle, and the production utilised the finest stuntmen, choreographers, writers and composers of the period. It holds up extremely well after all these years and continues, with good reason, to be watched and adored by movie lovers all around the globe. Appropriately for such feted cinematic fare, the transfer to HD is excellent. It’s not lustrous by any means, but the restored print is completely free of grain and artefacts and I presume this is as good as the film is ever going to look. As befits a movie with a 2 ½ run time Where Eagles Dare boasts a score from Ron Goodwin that is unrivalled in both its intensity and grandiosity, and many of the stunts appear exciting and accomplished even to modern sensibilities. Unlike the slew of other Eastwood outings released by Warner Brothers in recent weeks, Where Eagles Dare also contains a small amount of bonus material in the form of a 12-minute vintage featurette. Whilst short and showing its age it makes for interesting viewing, consisting of behind the scenes footage, a detailed look at the film’s many impressive special effects and interviews with several cast members (though unfortunately not Burton or Eastwood). The featurette’s other unintentional benefit is that it allows you to see how the film would have it looked if it were left unrestored; it’s not a pretty picture, and makes you all the more grateful that Where Eagles Dare has made the transition to Blu.